The new headquarters for the Department of Homeland Security (DHS) is being built on a 176 acre campus on the top of a hill, with sweeping views of downtown Washington DC. I took of tour of the construction site on Saturday. What interest could a History Tourist have in the yet-to-be completed DHS headquarters? It’s going to be housed in restored historic buildings originally built as part of the U.S. Government Hospital for the Insane, better known in DC as St. Elizabeths. 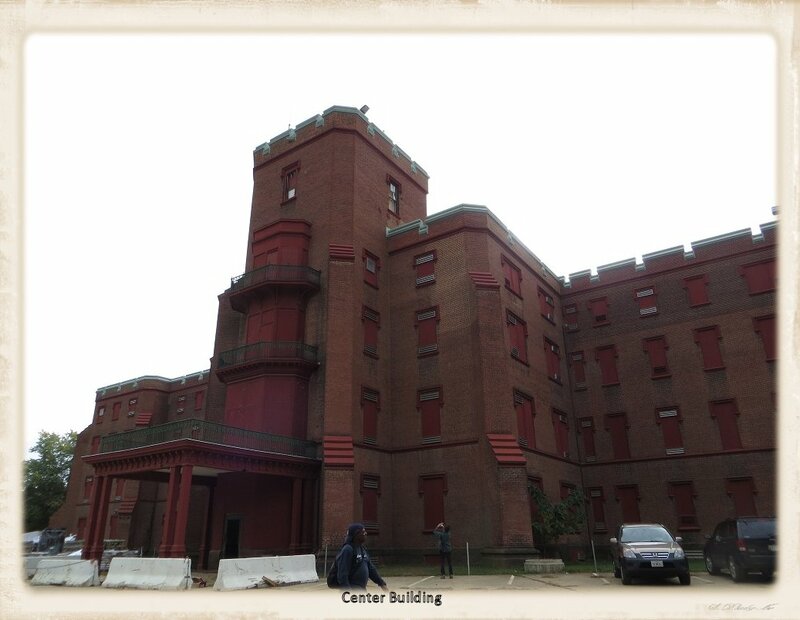 The tour of the west campus of St. Elizabeths (there’s also an east campus, where the city run mental hospital that’s home to John Hinkley is located) started with a waiver. That got my hopes up: maybe we’d be allowed into the old and unstable buildings. That wasn’t to be. So no inside pictures. 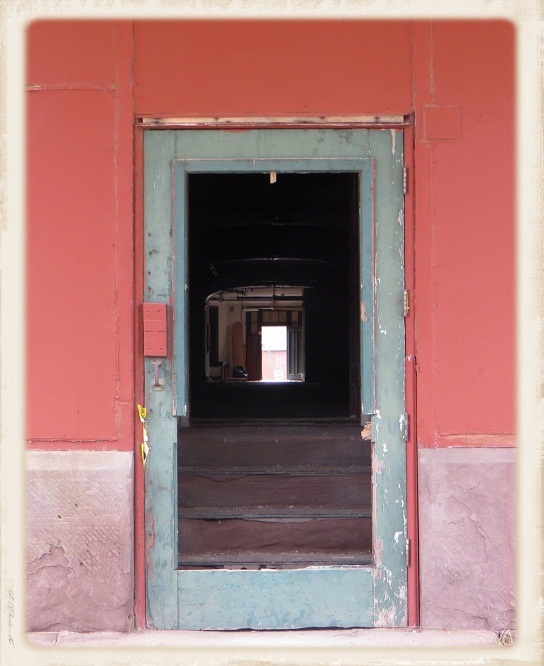 But the tour guide — a historian with the government agency overseeing the renovations of the St. Elizabeths buildings — told us where we could find pictures of the interiors online and I’ve shared a few of them here. 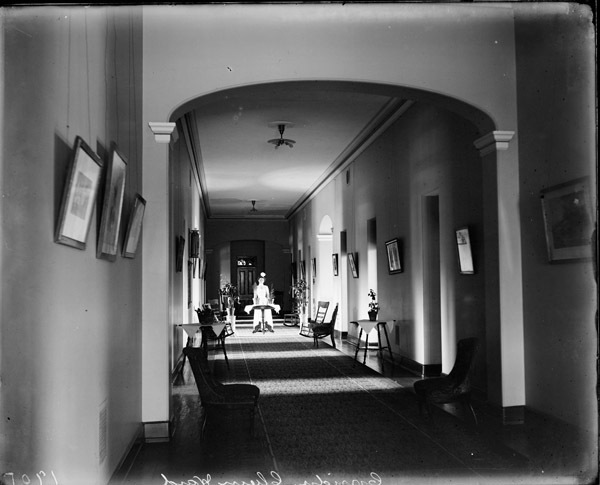 The black and white above is a 1905 picture of one of hospital’s dorm rooms. The picture of the patio shows the outside of that dorm as it is today. There was some concern, when DHS acquired the property, that they’d level all of the old buildings and build fugly new government buildings. Not happening. Preservation groups lobbied intensely and Congress was convinced to require DHS to renovate and use the existing historic buildings. In 1852, mental health care reformer Dorothea Dix convinced Congress to appropriate funds to build a mental health hospital for DC residents and for members of the Army and Navy – a new kind of facility that would provide humane care and cutting-edge treatments. Surprising, but Congress responded with $100,000 and the U.S. Government Hospital for the Insane in Washington DC was born (insert Congress jokes here). 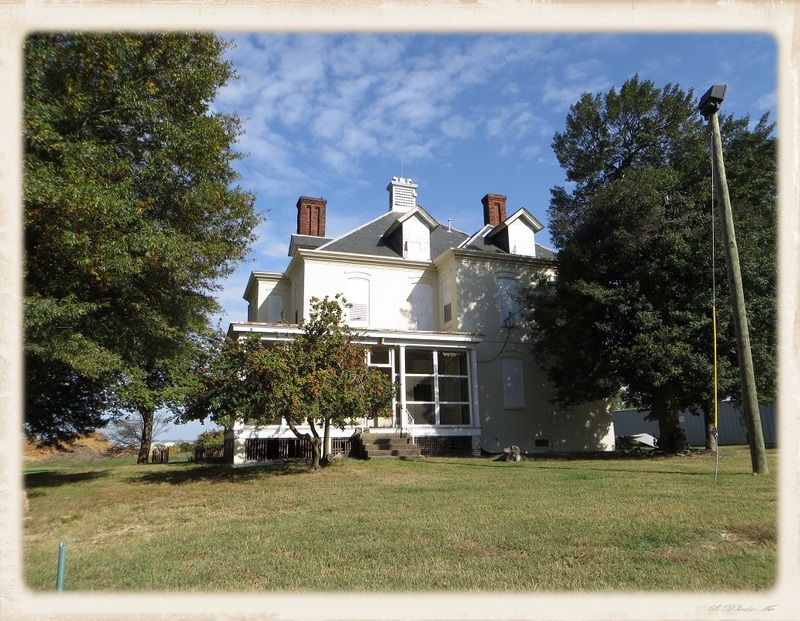 Dix knew the perfect site, on a hill on the south side of the Anacostia River. It wasn’t for sale, but whatever magic Dix worked on Congress, she also worked on the owner of the site and the Hospital for the Insane registered its first patient on January 15, 1855. The first building on the hospital campus was the Center Building, a long, 200,000 square foot building in the Collegiate Gothic style, with staggered sections to allowed maximum light and air into rooms for the patients. The men were in the west wing and the women in the east, with the most severely ill being the furthest away from the center. Ezra Pound, American poet and Nazi sympathizer, was committed to St. Elizabeths after being arrested for treason in 1945. Government records show that psychiatrists actually didn’t believe that he was insane, but the superintendent of St. Elizabeths was fascinated with Pound and kept him there to save him from prison. The superintendents’ office was in the center, where the large balcony is. Pound’s room was right around the corner. The picture below is one of the hallways of the Center Building. 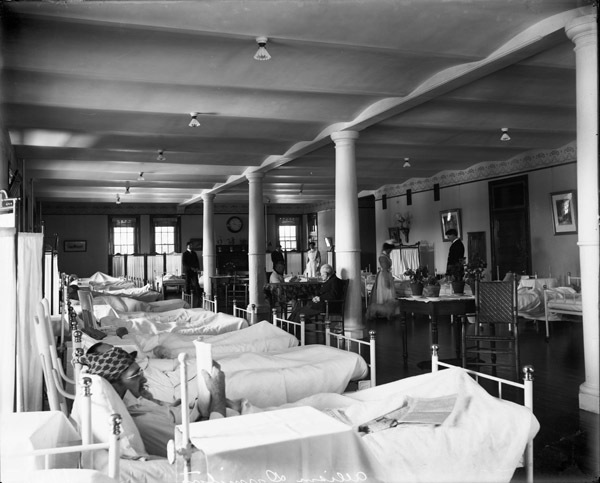 During the Civil War, part of the hospital functioned as a non-mental hospital for wounded soldiers. To avoid giving “Hospital for the Insane” as a return address, the soldiers called it St. Elizabeths (no apostrophe), the name given to the site in a 17th century land patent. When Congress changed the name officially from the Hospital for the Insane to St. Elizabeths in 1916, they too left off the apostrophe. There’s a cemetery on the northern edge of the campus. 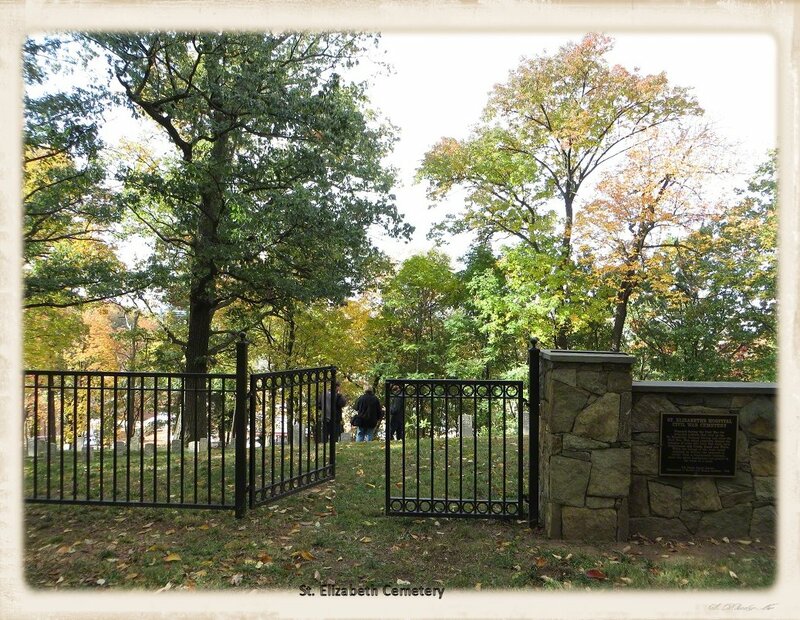 The plaque next to the gate says that Union and Confederate soldiers are buried there. The tour guide said that was wrong. There’s no evidence of Confederates. And the graves contain not only soldiers but civilian mental patients. Someone on our tour group had a great grand uncle buried there so while the group wasn’t allowed in the cemetery, the guide took the woman and her husband in to look for her ancestor’s grave. After the Civil War, the trend moved away from giant hospital buildings to smaller “cottages.” The Allison building, pictured at the top of this post, was one of the cottages. The Atkins Building, on the left in the picture above, was another. 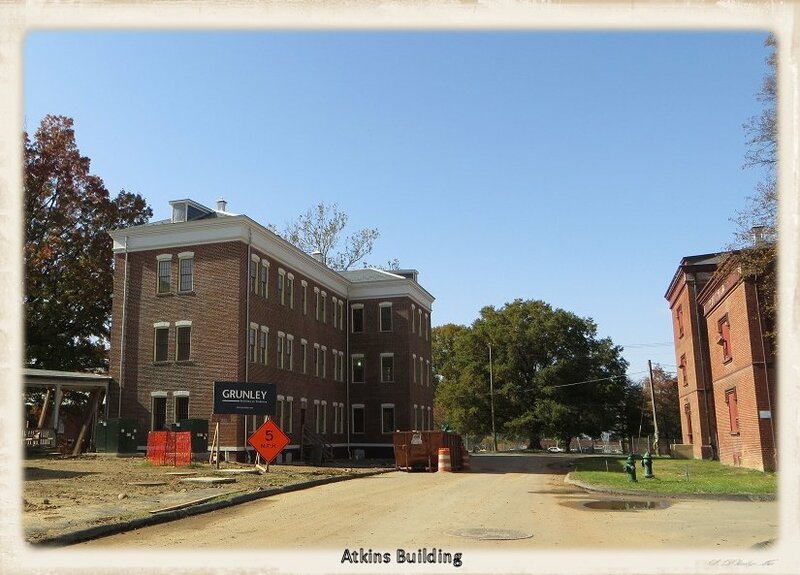 The exterior of Atkins has been restored, so the brick color is different from that of the unrestored building across the street. You can also tell that it’s had its windows restored, as they’ll eventually do with all of the original windows. Of course, old windows don’t have the security features necessary for any government agency, much less DHS. So there are new windows, with security features, behind the historic ones. 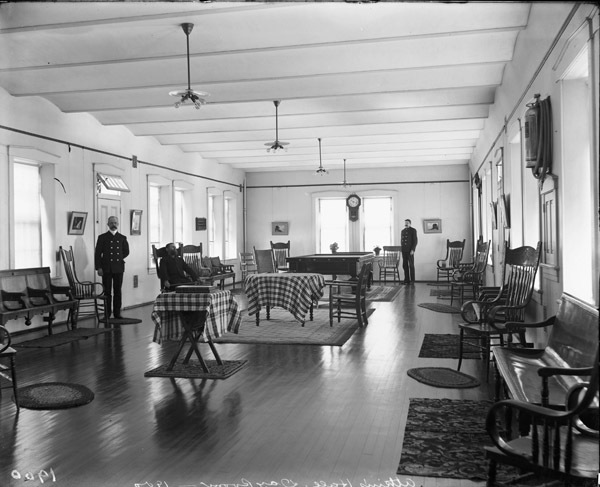 The small black and white picture is of the Atkins day room. At its largest in the 1940s and 50s, St. Elizabeths had over 7000 patients. There are 62 historic buildings on West Campus. Recognize the building above? 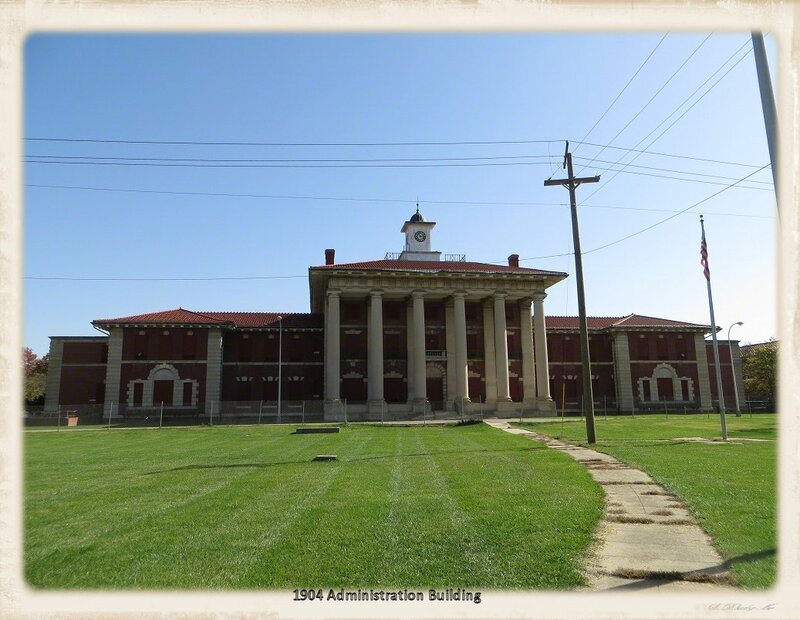 It was in the opening scene of the movie “A Few Good Men,” in which the St. Elizabeths campus played a marine base. It was really a records building. St. Elizabeths had a lot of records. There’s the hospital, dormatories, dining hall, auditorium, morgue, fire station, chapel and staff housing. There’s also stables and barns, because they kept animals, and greenhouses to grow flowers for arrangements for the wards. Then there was the Burroughs Cottage, above, built in 1886 for patient Sarah Borrows, the daughter of a wealthy DC family. In 1893, after the death of Sarah’s father, Sarah’s mother went to live at the cottage with her. 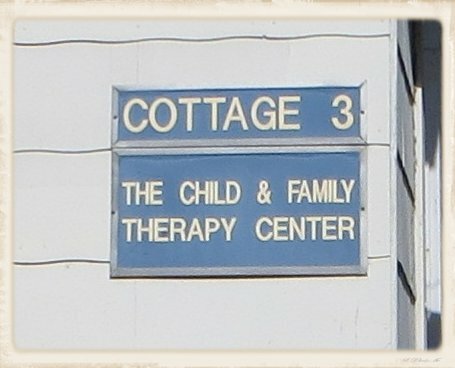 A misspelling of the family name somewhere along the line has endured in the name of the cottage. A sad story from the tour guide: He was reading case files from St. Elizabeths at the National Archives last week and came across one from 1960 — that he shouldn’t have been able to access because the person involved might still be alive — about a 6-year-old boy who had a lobodomy the year before. The tours are sponsored by the DC Preservation League and the Government Services Administration. It’s free and reservations can be made by contacting the Preservation League. There’s only one tour left this year, however, and it’s already full. But they’ll start up again in the spring. Credit for the historic pictures goes to the National Archives and Records Administration. If you’re interest in seeing more of them, they can be found on their website here. Gallery | This entry was posted in Washington DC and tagged Cemetery, Civil War, Government Hospital for the Insane, mental health hospital, St. Elizabeths Hospital, Washington DC. Bookmark the permalink. Good old “Dragon Dix”, should’ve known she would have a part in this after reading ‘Hospital for the Insane’. We have a Golden Retriever named Dixie and when we call her Dix it always brings to mind Dorothea Dix. I’ve never heard her called “Dragon Dix” but after reading up on her, I can see how appropriate that nickname would have been. Wonderful post. It reminds me a lot of Eloise, the old mental hospital in Detroit. They really were an entire community. Thanks for mentioning Eloise. I’ve never heard of it and find it irresistable as a name for a mental hospital, so looked it up. I’m glad St. Elizabeths buildings aren’t suffering the same fate that most of Eloise’s did. I agree. If you are interested, the book Annie’s Ghosts is about Steve Luxenbourg’s search for his aunt, who was institutionalized there. The book’s focus is the family history, but it also gives a fair bit of the history of the hospital as well. I’ve downloaded the book. Thanks for the recommendation. I am a contractor hired to renovate the Center Building for DHS. I have access to the building so if anyone has specific areas inside the Center Building they would like photographed please let me know and I will photograph and post. Complete gutting should be complete by end of 2015. Thanks for the offer. Such an interesting project. I just saw an obituary in the paper from 1919 while looking for my great grandmother’s death record & someone with her name and age died at St Elizabeths in 1919. I really don’t know if that is her but I can find nothing about her after the 1910 census and only notes that she died prior to 1920. With the odd amnesia that appears to surround my family for the time period , I am beginning to suspect that perhaps the death notice is for my greatgrandmother. Can a person get the records now concerning someone who may have been a patient? Our tour guide, who was a historian with the General Services Administration, said that he read St. Elizabeth’s patient records. So I’m sure that they exist. How available they are to the public, however, I’m not sure. I can think of three places I’d try. 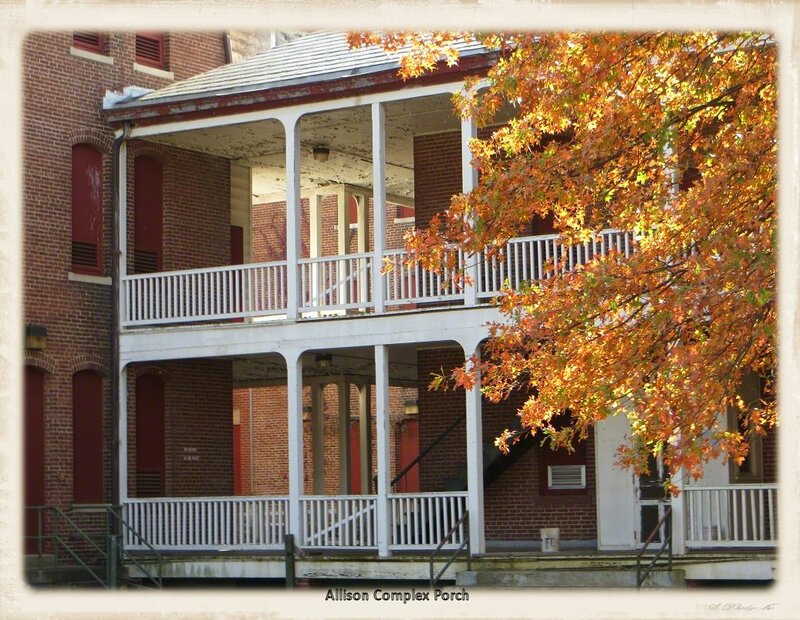 The first is St. Elizabeths Hospital, which still exists and is running under the auspices of the DC government. I just did a search for their webpage (http://dbh.dc.gov/page/saint-elizabeths-hospital) and they list an email address for questions. The second is the General Services Administration. Their website (www.gsa.gov) has a staff directory that includes the staff of their historic preservation office. You could try one of them (I’d start with their historic preservationist, Jeffery Jensen). The third is the National Archives, which has some of St. Elizabeths administrative records online. I doubt patient records would be there, but you may be able to contact someone on staff who could point you to the right place. Hope this helps. Good luck with your search. The tour I took was six years ago and I don’t remember the name of the guide, who work for the preservation department of the US General Services Administration, who lead our tour. He was the one who shared the information about where we could find the photos that I used. You could get in touch with them or the DC Preservation Society, though. They might know where to find other photos. Looking forward to seeing your play someday.